"Battleship Row" on December 7, 1941, after the Japanese attack. USS Arizona (BB-39) is in the center of this view, burning furiously. To the left of her are USS Tennessee (BB-43) and the sunken USS West Virginia (BB-48). Men on the stern of USS Tennessee are playing fire hoses on the water to force burning oil away from their ship. 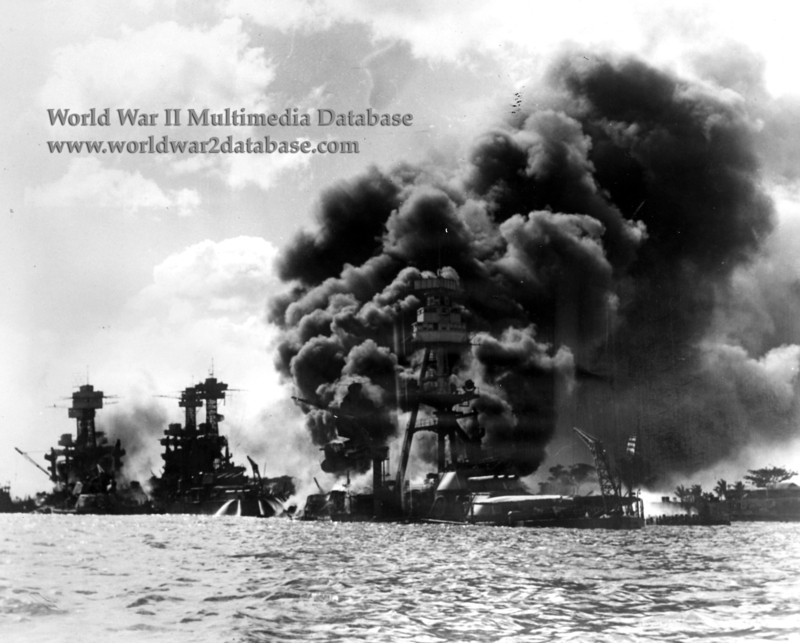 She was hit by two bombs, which damaged two of her four gun turrets, and was scorched by burning oil from the sunken USS Arizona. In late December, after temporary repairs, Tennessee steamed to the Puget Sound Navy Yard, Washington, for an overhaul. West Viriginia was hit by two bombs and at least seven torpedoes, which blew huge holes in her port side. Skillful damage control saved her from capsizing, but she quickly sank to the harbor bottom. More than a hundred of her crew were lost. Salvaged and given temporary repairs at the Pearl Harbor Navy Yard, in April 1943 West Virginia steamed to the West Coast for final repair and modernization at the Puget Sound Navy Yard. The battleship emerged from the shipyard in July 1944 completely changed in appearance, with a wider hull, and massively improved anti-aircraft gun battery. Both battleships served as gunnery platforms for invasions throughout the war. Arizona's wreck was never raised and remains as a memorial to this day.